“Looking into the future always means playing with ideas. 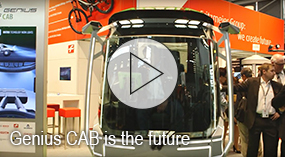 The Smart CAB bundles ideas that clearly benefit users,” concludes Fritz Schadeck, Vice President at FRITZMEIER Cabs. 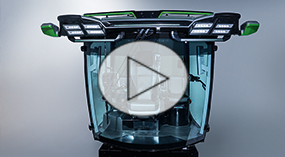 “We show these ideas at Agritechnica 2017 like a firework of innovations whilst still focusing on the vital subjects such as safety ordriver comfort.” Explore now our firework of innovations in our new Smart CAB video. “At Agritechnica 2017, the CCC launched its second model, the Smart CAB, utilizing modularity to reduce time and cost of development while still offering flexibility for individual applications and needs….” Please click on the image to view the OEM Off Highway Magazine reportage. 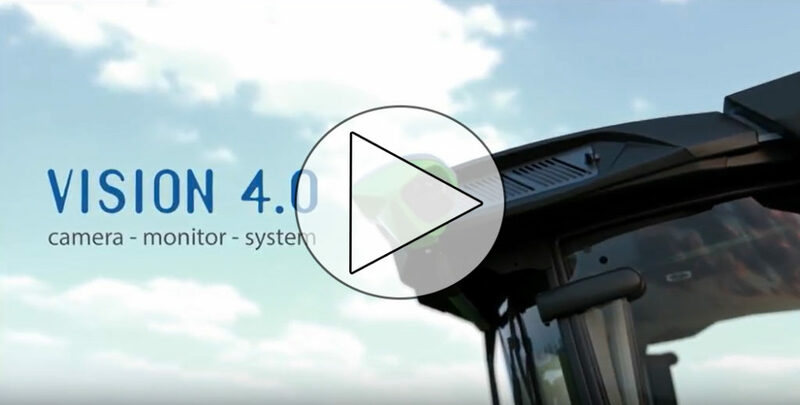 In the Smart CAB Mekra Lang presents an electronic mirror replacement system for agricultural machines, which constitutes a significant advantage to the driver with regard to vision and ergonomics. Explore the video by clicking on the picture. 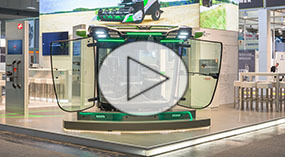 regarding the Genius Cab at the BAUMA 2016.
integrated structure with a “softcab” made up of special welded aluminium profiles which have led a 30 percent reduction in weight and the fitting EXO-ROPS/FOPS which is additionally placed above the cabin and is suitable for weight categories ranging from 10 to 50t. Please click on the image for futher innovation of the Genius CAB. 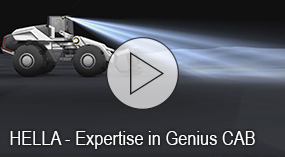 “All innovations incorporated in the Genius CAB serve specific user needs with near-series technology. For OEMs this means an opportunity for final series implementation while risks and costs remain manageable. The economic potential for customers and manufacturers is considerable,” explains Professor Jens Krzywinski of TU Dresden University of Technology. 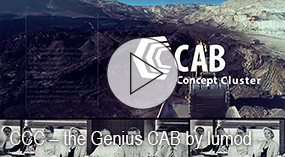 Please click on the image for a demonstration of all innovations of the Genius CAB. Cluster. This involves not only the use of LED worklights that are based around automotive matrix technology, but also the integration of HELLA ZEROGLARE technology, a sharp cut-off line to prevent the dazzling of third parties. Please click on the image for all innovation of HELLA. The interior is equipped with a 12″ central touchscreen panel, which is integrated into the armrest of the adjustable seat along with the joystick. All functions and machine Parameters that are controlled by the operator are centrally visible and adjustable even in adverse working conditions. An adaptive user interface collects the key Parameters and ensures safe and expedient Navigation. 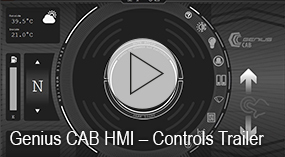 Please click on the image to see all function of the control Panel.